Preparing food for school tours at the Covenhoven House - 1852 restored home in Freehold, NJ. 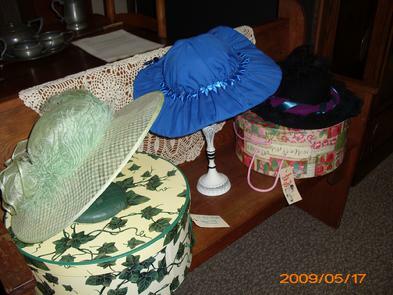 One of the hat displays at the tea. The audience enjoyed 'Victorian' parlor games, tea and refreshments. Tinky Weisenblatt is a cookbook author and singer, she joined us for the program and was very generous with her review! Thanks Tinky! The site is her personal blog and has some great information and is very interesting reading. Enjoy!